FESPA Brasil 2019 success cements show as main digital printing exhibition in Brasil. 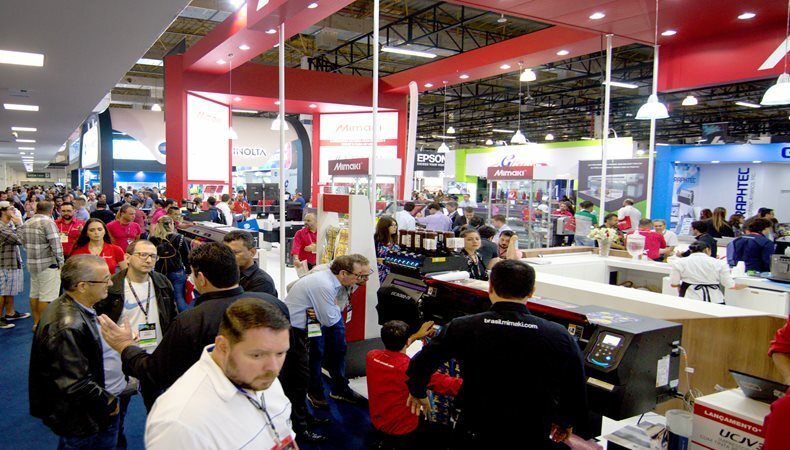 18,645 unique visitors attended FESPA Brasil 2019 between the 20th – 23rd March at the Expo Center Norte in São Paulo, Brasil. The exhibition experienced more than a 30% registration growth. Preparations for FESPA Brasil 2020 have already begun and the theme of the exhibition will be “The Power of Printing”. The exhibition will once again be located at the Blue Pavilion of Expo Center Norte in São Paulo from the 18th March – 21st March 2020. The exhibition featured free conferences. For 2 days specialists at the Graphic Intelligence congress discussed current trends, new technologies and the strategic issues experienced by printing businesses. During the Digital Printing Academy visitors learned about the best practices for dealing with print, prepress and post press. The FESPA Digital Textile Conference is a regular feature at FESPA Brasil. The conference was sponsored by Global Química & Moda and featured relevant concepts in the digital textile printing market, whether in fashion, signage, decoration and other markets. Felipe Simeoni, Marketing and Market Intelligence Manager at Global Química & Moda comments: "We were honoured to be invited by FESPA to attend 3 seminars at the FESPA Digital Textile Conference. It is an event that features an abundance of information, content and trends. Speakers and visitors had the opportunity to exchange their experiences and ideas." Alexandre Keese describes the purpose behind the initiatives: "APS and FESPA believe that highly relevant content adds value to the professionals who visit the exhibition. That's why we invite entrepreneurs and renowned professionals in the industry to share their knowledge. CAMBEA’s vehicle wrapping competition took place at FESPA Brasil 2019 with fierce competition and was one of the most exciting finals in the competition’s history. The winners, the WS Adesivações team included Francisco Wellington da Silva and José Rafael Xavier from Fortaleza are two-time champions. Gênesis Envelopamento, from Rio Grande do Sul came second and GRC Adesivação, from Paraná came third. With their win, WS Adesivaçõ’s head wrapper, Francisco Wellington da Silva has qualified and will go on to compete at the World Wrap Masters Final 2019 in Munich, Germany. WS Adesivações commented on their victory, José comments: "Once again we had the opportunity to represent the Northeast region at CAMBEA. We want to thank God, our sponsor Abude Comunicação Visual as well as Alltak’s and CAMBEA’s organization staff. “Francisco says: "It really is a great event, it is such a proud moment for us to be able to take part in CAMBEA and win the title. We thank God and everyone who has always supported us. We are very happy." Marcelo Souss, the organizer of CAMBEA spoke about the quality of the competition: "This year, CAMBEA’s final was similar to last year’s competition where it was very close between the first and second place winners. There was only a 5-point difference between the two teams. 24 teams competed with four cars. I am thrilled that the event was such a success. We are very excited for next year’s CAMBEA which will take place from 18th – 21st March 2020. We look forward to seeing you there! FESPA Brasil’s Sales Director, Alexandre Keese comments on this year’s CAMBEA: "The ninth edition of CAMBEA was special. It’s the largest vehicle wrapping competition in Brasil and across four days competitors from all over Brasil and other countries competed. The winner will now go on to compete at the Wrap Masters held at FESPA in Germany."